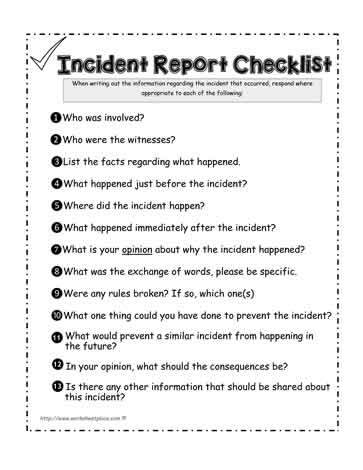 A guiding format to help support reporting incidents. List the facts regarding what happened. What happened just before the incident? What happened immediately after the incident? What is your opinion about why the incident happened? What was the exchange of words, please be specific. What one thing could you have done to prevent the incident? What would prevent a similar incident from happening in he future? In your opinion, what should the consequences be? Is there any other information that should be shared about this incident?